The classical guitar, also called the Spanish or nylon string guitar, as we know it today was developed in the late 19th century. The gorgeous body curves then replaced different shapes it previously assumed, and the nylon and metal wound strings replaced the processed sheep guts which somehow held up to the task at the time. In a way it is almost impossible to talk about its first versions and origins, since ancient sources often describe similar instruments. For example, the following lovely 9th century graphic depicts a dude who is happily jamming and shredding on his brand new axe. 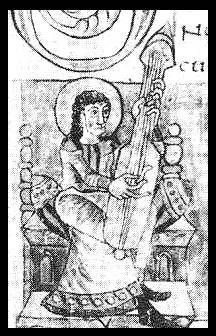 A 9th century illustration, showing a guitar-like plucked instrument. Apollo kitharoidos. 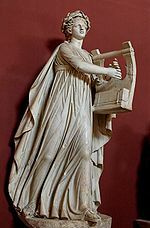 Marble, Roman artwork, 2nd century CE. Unlike our proud hero the didgeridoo, we are free to consider that it’s cousin guitar has been around for a significantly shorter time period. It is therefore very interesting to notice that time is not the the crucial factor in how the features and abilities of an instrument are explored, but there seem to be some other more significant ones. The guitarist willing to evolve and expand his knowledge might face a quite different situation from the didgeridoo player. Only a few distinct styles and technical elements are commonly bound to the didgeridoo playing. A didge player will have to be his own teacher practically from the beginnings, since after learning the drone, toots, voice, percussive playing, and some other elements, he will face the scary open spaces and unbelievable freedom. The didge player must explore on his own a lot, often lacking the musical support and common knowledge of techniques, despite the very archaic tradition of the instrument. 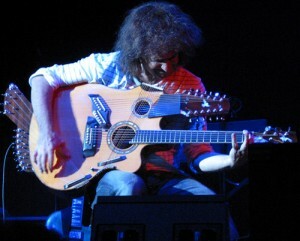 The guitarist on the other hand will find a raging range of techniques and systems, and will need an experienced teacher to direct him on a clear path through the forest. Allow me illustrate a peculiar situation facing a guitar player. For example, think of a flamenco guitar player right now. Do you not immediately picture a long haired, dark skinned and preferably Spanish male, with a blazing red shirt, a passionate stare, and an eager body posture and attitude? You probably projected at least some of these expectations, and we all do, because such a strong image is bound to the term flamenco. People often see and hear what they expect they should see, and do not open up to the unexpected, simply out of a habit of thought. Allowing a new image to settle in requires more freedom and flexibility of the mind, and sometimes some letting go as well. It is funny how this way of thinking is often associated to a stereotypical guitarist. There’s a good joke illustrating the situation. 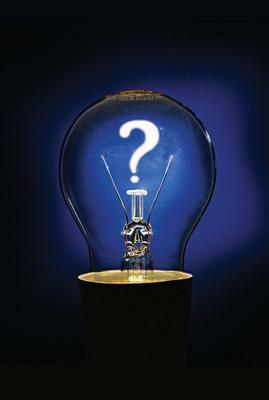 Q: How many guitarists does it take to change a light bulb? A: Ten. One to change it, and nine to tell him how they would have done it better. 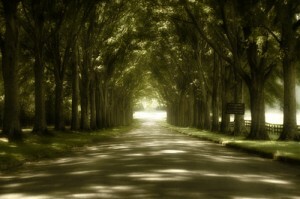 It is sometimes difficult to step out of the boundaries and find your own way. In that context, when time will have passed, I will personally probably remember this this current period of time as exploration and experimentation. The whole Druyd will too, among other things, since we’re now hibernating new long term ideas, and concentrating on short term goals, such as defining the new sound and format. What else can there be said about the guitar, which would still be fresh and new, when so much has already been tried out? I would say that learning new technique and expanding personal limits requires a humble attitude. Why? Because before you know it you might be fooled by that which you don’t know! I will leave you with some of the best words of advice I have heard so far. These are the words of a true guitar master, whose name I now shamefully forgot (…). He was asked what makes a good guitarist, and this was his answer. Even though I fail to accredit his name here, his wisdom now surpasses the illusive mortal boundaries and is once more set free. “A good guitarist must be a good person, must be a good soul. Must be a curiouos person, must be a humble personality, always trying to learn and discover. Must be also a critical personality, just to discover where you are and how to get better. And it must be somebody that through music discovers the language that could be possible to express with this instrument. Or with another instrument. The most important instrument is the idea, or the ideas. p.s. Please check the comments bellow because I will do my best to retrieve the name of this master and post it there. sometimes I feel lost because of too many options… it’s like I don’t want them all to be there… revealed. and available. first you start simple, then you start guitar sporting, speeding, competing, then you dream about 7-string, 8-string saws… then you get loads of effect pedals until there are so many you just can’t control them all any more… and then you realize it all boils down to 6 strings, natural acoustickness, simple as that. =) liked the joke and the rest of text =) D#! Ah yes, the many pedals of a guitarist ! I agree with you, ‘back to the basics’ is always good to remember. Well at least sometimes… But back in the days you used to have only a couple of analogue pedals, I remember that’s how my elder brother and his generation used to kick it, old school. You know what this situation reminds me of, it reminds me of those green, apple flavored hard candy ‘šumi’. The inside was just phenomenal, and I often endured the boring hard shell just to get to the exquisite inside… Such wonderful chance that our instrument is a candy full of precious, tasty beauty !